In Mark Lawrence‘s Self-Published Fantasy Blog-Off, ten SFF review blogs joined forces to read 300 self-published fantasy novels. Each blog read ten books and chose one to advance to the top ten. The book that we advanced was Kaitlyn Davis‘s The Shadow Soul (here’s our review) and we gave it a score of 5 out of 10 on Lawrence’s scale. We are currently reading the remaining top ten SPFBO books. Here is our review of four of them. We’ll get the last five books done soon. The same man passed in quick order through the following stations of Ascension: the Zoeian sensate, the Ennoian warrior, the Noussian scholar, the Sigean holy servant, and finally the Aletheian perfecti who faced the White Gate with arms raised. Simple. Elegant. The ineluctable truth of the spiritual world… Somewhere even now, at this very moment, the spirit of Lord Enderl Kyferin is housed within the fresh and innocent body of a newborn babe. Shorn of his memories, he begins the next stage of his Ascension with every blessing, coming one step closer to passing through the White Gate and into eternal bliss. He’d never raped, never tortured, but there had been those… who had. Tiron had simply turned away from that, telling himself that… Those men would be punished when they died, being reborn in Zoe or farther down the chain. The main characters are interesting, the side characters equally so (which is more impressive in my book and shows an author serious about their craft rather than one taking the easy roads), and the prose is smooth. The shifts among the various POVs are mostly fluid, though one POV — that of a non-human “Kragh” — remains perhaps a little too separate from the rest of the novel and thus feels somewhat out of balance, though that is mostly in how it fits into the novel’s full context rather than due to any particular problems with that single storyline. Tucker carried me through a nearly 500-page book and left me looking forward to the second, which pretty much says it all. Paternus is a wild ride. The story, which takes place all in one day (a day that, had I been the protagonist, I surely would not have survived due to extreme emotional and physical exhaustion), is about Fi and Zeke, a couple of young adults who work in a nursing home and get caught up in a war between gods and mythical creatures from just about every religion and pantheon you can think of. These folks are the “Firstborn,” all descendants of the Paternus who was the first man ever born. They’ve been fighting each other for millennia and now Fi and Zeke are caught up in their war. All humanity is at risk. This imaginative story, which is action-packed. exciting, and often gruesome, reminded me of Scott Hawkins’ The Library at Mount Char. 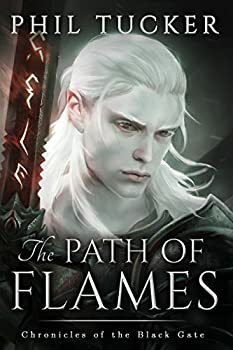 Dyrk Ashton’s writing is rich and vibrant — at a higher level than any of the other books I’ve read for SPFBO. It’s got a few quirks that I’d like to see edited out such as the present tense voice, some head-hopping, a few too-long infodumps, and the Gary-Stu-ness of Zeke. I also think it’s too ambitious as far as the number of religions, legends, and myths Ashton managed to pack into one novel. Many readers will love this aspect of the story because it gives it a sense of epicness, but to me it felt a bit cluttered. I rarely say something like this, but I would have preferred for the story in Paternus to be spread over two novels and to take up more than one day in the lives of our heroes. But I suspect many of Ashton’s fans will disagree with me on that. 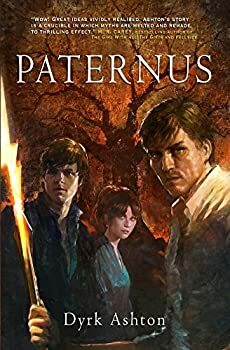 For a debut, Paternus is mighty impressive and bodes well for Ashton’s future writing career. (He simply needs to level down instead of level up, in my opinion.) I certainly expect to be seeing Dyrk Ashton’s name on some books in my local bookstore someday. His work deserves a mainstream publisher. In 192 A.D., Muirne Muncháem, a young and very pregnant woman, travels alone through the wilds of ancient Ireland, seeking a sanctuary for herself and her unborn child at Ráth Bládhma. Three years before, a young druidess, Bodhmhall, had left her clan with six other people, including her lover, the woman warrior Liath Luachra. Since then they’ve been living in a hidden, secluded valley, creating a pleasant, if very small, community. Their peace is shattered when Muirne, Bodhmhall’s sister-in-law, arrives, asking for refuge and their protection. Bodhmhall can see that Muirne’s unborn child has an aura that shines brighter than any she has ever seen. Because of that, and because it is her dead brother Cumhal’s child, she agrees to offer Muirne sanctuary. But the group soon finds that two separate bands of twenty to thirty warriors, one including a mutilated druid with terrifying mind powers, are seeking Muirne and her child, and will stop at nothing to get them. It is only a matter of time before they find the way to Ráth Bládhma. 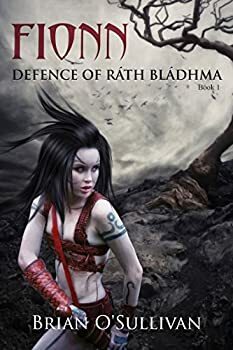 Defence of Ráth Bládhma is a hard-hitting tale of life in an ancient time, when life was harsh and uncertain. It is the first book in Brian O’Sullivan’s FIONN MAC CUMHAILL series, based on the legend of the mythical Irish warrior hero Fionn mac Cumhaill. Defence of Ráth Bládhma tells the very first part of Fionn mac Cumhaill’s story, the time before and immediately after his birth. O’Sullivan has added some imaginative twists to the original legend, including the relationship between his aunt Bodhmhall and Liath Luachra, and has fleshed out these and others who were part of Fionn’s early life, creating complex and lifelike characters. The story is fairly true to real life in primitive times, when death, hostile clans, and shortages of food were constant threats. O’Sullivan has vividly recreated the tough living conditions of a small community, with detailed descriptions of their way of life. The fantasy element is seen only in the druidic powers possessed by Bodhmhall and the enemy druid, one of the Tainted Ones who is no longer fully human, and has the power to affect the minds and thoughts of others. The grim atmosphere is lightened somewhat by the timely arrival of Bodhmhall’s former husband, Fiacail mac Codhna, at Ráth Bládhma. He and his two men provide some much-needed assistance with the defense of this small, walled community, along with a hefty dose of bawdy humor. Rhis is a cold and heartless killer. She does it for money, dispatching whoever she’s hired to hit with no questions asked. She uses her earnings to live in luxury and is saving for an early retirement. But then she is assigned an enormous sum to kill a child and suddenly, she finds a line she won’t cross. To avoid retaliation from the emperor for not fulfilling her contract (a terrifying bounty hunter is on the way! ), she teams up with her mark and a smuggler and sets out to discover why the emperor so desperately wants this unknown farmboy killed. 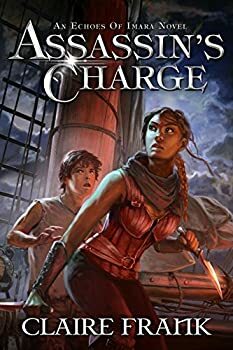 Assassin’s Charge is an enjoyable but not excellent adventure fantasy. I read it in half a day and was entertained. The novel is competently written and reads smoothly, but the prose is workaday with thin world-building and too many scene descriptions that feel conventional and lifeless. The pace is quick but action scenes tend to feel repetitive and artificial as Rhis effortlessly hoists herself over railings, scales walls, scurries up the sides of buildings, throttles men, and escapes from difficult traps. Often I found myself thinking “that’s unlikely, yet I’m still reading!” It’s also disappointing to note that we never learn the answer to the central question of the plot. (And this book is, as I understand, a stand-alone novel). Most importantly, though I liked all of the male characters (especially the farmboy, the smuggler, and the bounty hunter), it was hard for me to care about what happened to Rhis the heroine — I just didn’t like her at all. Claire Frank makes it clear that I’m not supposed to like her at the beginning, showing us numerous ways that she is thoughtless and uncaring. But by the end Rhis is a different person and I’m supposed to have changed my mind. However, my feelings toward Rhis never changed because I was never convinced that Rhis had changed. I didn’t see the gradual steps of her development, so I never believed it and never warmed up to her. Frank attempted to give Rhis a humanizing weakness — she has OCD — but I never felt that it was real, either. Same with her sudden romance with the smuggler. ASSASSIN’S CHARGE; Kat, when I read that she has OCD, I had an immediate flashback to ELEKTRA, the movie. That was the supposedly humanizing thing Jennifer Gard– I mean, Elektra, lived with.